She is now almost five-years-old, and although we no longer track her age by the month, I still find myself thinking “this is my favorite age” on the regular. She is SO MUCH FUN! Yesterday I shared my easy fall tablescape, but what you didn’t see in that post was Kate’s take on the situation. Kate informed me before her first day ever of school that she wanted to be “a blogger and a writer” when she grows up. She has since decided that “growing up” is no longer a requirement – she is a blogger now. Since then, when we walk into a craft store she asks, “Mom, can we get some things for my blog while we’re here?” If I’m working on a project and she spots some scraps of ribbon or anything with glitter she asks, “Mom, can I have this for my blog?” Sometimes she’s willing to join me on my project, and other times she wants to create something that’s all her own. This was one of those times she wanted to fly solo. 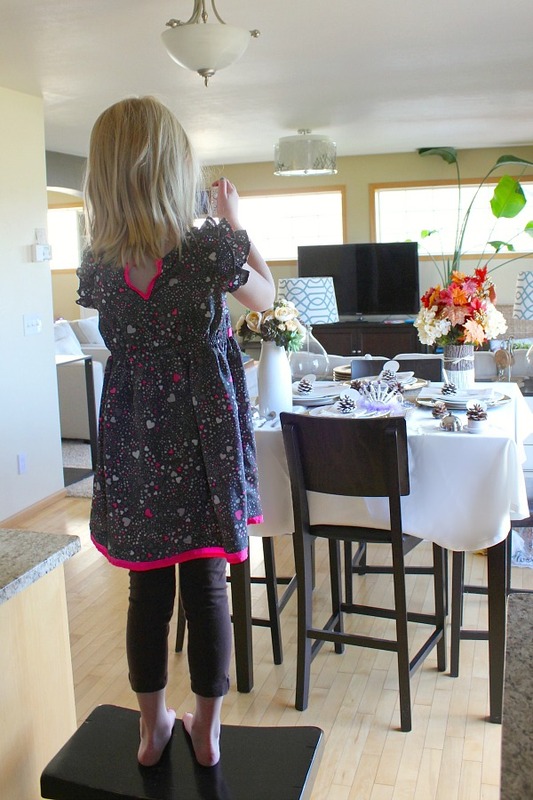 I was setting our table to photograph pictures for my fall tablescape post and Kate just wasn’t feeling it. 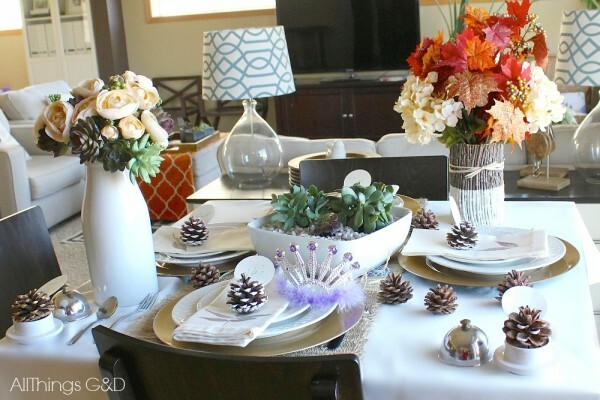 She insisted we needed more painted pinecones than simply one at each spot (I explained to her they were place card holders but that didn’t change her mind), suggested I use the colorful fall leaves arrangement in the twig vase instead of the roses and succulents, and when I opted for the wooden chargers over the gold glitter ones she nearly put me in timeout. “Yeah. For MY blog,” she replied. Her first order of business, of course, was changing out those chargers to the sparkly, glitter ones. 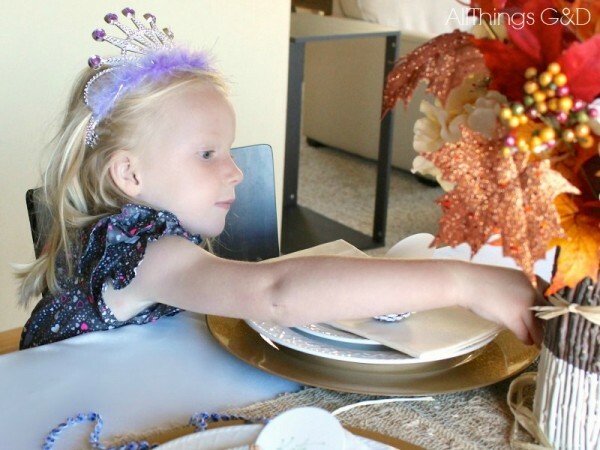 Beyond that, she liked a lot of the items from our fall decor, but decided her tablescape needed a little something more, so she went to her playroom and raided her accessories bin. 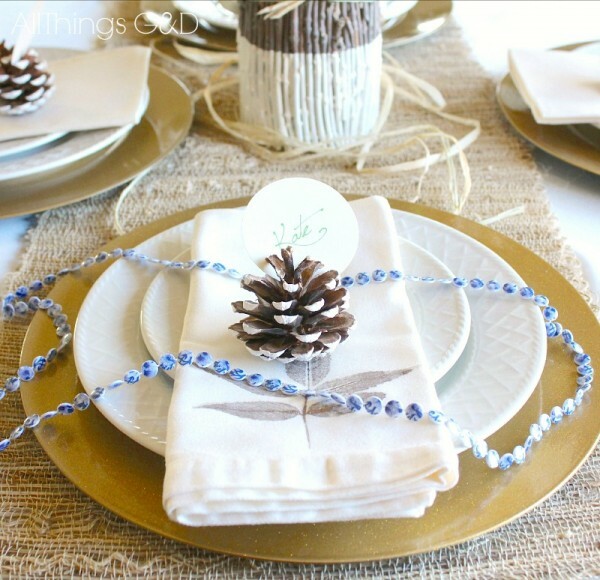 Necklaces over napkins – look for it in the next Pottery Barn catalog. Kate added some colorful fall leaves, more pinecones, and a few necklaces to the mix. She also decided the succulents and roses were okay, so out came another vase. And since we were keeping those succulents, the live succulent planter had to be added, too. 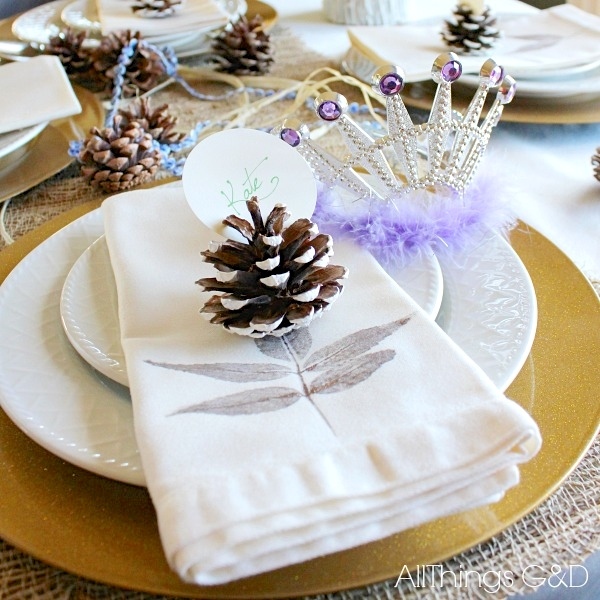 The additional pinecone place card holders on the corners (sitting in butter dishes) are for her cousin (a.k.a. her “baby”) Eli and their dog Morty. Lastly, Kate added her crown to her spot, just so there was no confusion as to where the Queen of All Things Sparkly sat. 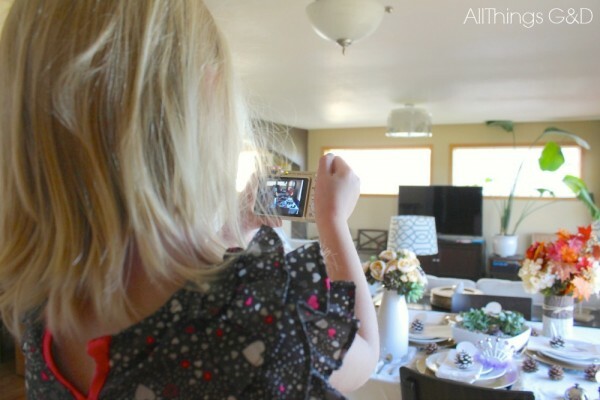 Once her tablescape was ready it was time for pictures. After watching me for so many years Kate knew exactly what to do. She hopped up on a stool and started photographing away! Her hair isn’t combed and her clothes aren’t buttoned…but her table looks good. Have I mentioned this is my favorite age? Learn more about Kate’s journey from teething to tablescapes in Kate’s Monthly Posts! Kate has really great decorating skills! I love the fall leaves, pinecones and the tiara! My daughters are 10 and 12 and it’s a really great time of life. I love every age! Thank you so much, Sami! This parenting thing sure is a blast!